Grown on our Michigan farm. 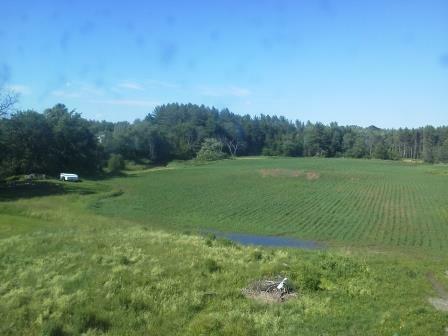 Photgraph of our Maine farm. Research studies show rats being fed GMO corn developed tumors in only 3 weeks. Having organic GMO free foods is essential to good health. When farming for total respect of our Lord's creation, it is best to do it His way. Start by using non-GMO seed. GMO's are genetically modified organisms. Big companies have joined with pharmaceutical companies and are trying to take over our rights to grow good food. The seeds they have perverted do not reproduce true, and farmers are forced to buy new seed every year. In poorer nations a portion of the crops are havested for seeds for the following years planting. Those who purchased GMO seeds could not produce a new crop resulting in economic hardship and starvation. 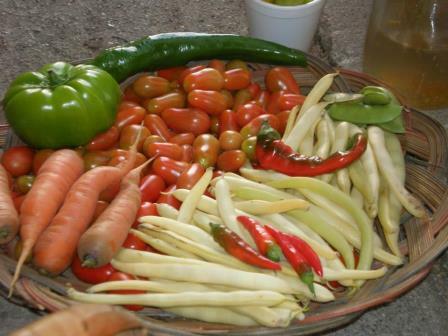 Using heirloom seeds, we can safely plant food that will not harm other crops through polinization. Physical and organic pest control, organic methods of weed control can be accomplished with greenhouses, fences, screen/nets and companion planting. Companion planting is not planting the same plant next to each other; but using other plants to fight off insects and diseases to protect plants that get attacked. All animals, plants and bugs, everything, has a purpose. Everything is connected. We must use our knowledge to create a balanced system of food production. Using compost to feed the soil, and mulch to control weeds keep plants evenly moist and weeds smothered. Over time the soil keeps getting better. Not plowing keeps soil substructure, microorganism networks, and earthworms and other beneficial insects intact. Plus weeds are kept down, since some seeds only germinate when exposed to sunlight. Observing what weeds grow, indicates the soil health. Then one can determine what is action needed. Using rainwater is good for watering crops. Now, one needs to address chemtrails and any regulations against collecting rainwater. So do your research, rainwater as is no longer at its best and may need to be filtered. Greenhouses offer a controlled environment protecting crops from many adverse conditions. Our initiative for healthy foods includes construction of greenhouses. Help fund the creation and development of Organic GMO Free Farms.